Along with its flagship parts which have already been taped out, AMD is also developing new GPUs to power their mid-tier Radeon lineup. According to reports from VR-Zone, it seems like AMD is preparing the Trinidad GPU which will feature the existing 28nm process technology and would replace the Curacao Pro chip which is fused inside the Radeon R9 270 graphics cards. While the name of the graphics card which will use the Trinidad GPU is not mentioned, it does replace the Curacao Pro GPU which was fused inside the Radeon R9 270 graphics card. The Curacao Pro chip itself isn’t actually a new chip since its a rebranded Pitcairn GPU which was featured on the Radeon HD 7870. AMD’s Radeon R9 270 and Radeon R9 270X share two different Curacao chips, the Curacao Pro on the 270 and XT variant on the 270X however there’s little difference between these two chips since both share a similar core configuration of 1280 stream processors, 80 texture mapping units and 32 raster operation units. Even the memory configuration is the same, the only difference is the price and the core clock with the Radeon R9 270X clocked at 1050 MHz while the Radeon R9 270 is clocked at 925 MHz. So it can be said that the Trinidad GPU will not only replace one Curacao based graphics card but both. Some specifications mentioned by the source include a 2 GB memory and a 256-bit memory bus. The codename of the chip is named after the Trinidad and Tobago Island based in Southern Caribbean along the coast of South America. The graphics card may possibly be named Radeon R9 370 or Radeon R9 370X featuring similar GPU enhancements as the Tonga core with updated performance efficiency. The main question is, what is this chip going to be competing against? It is known that NVIDIA is launching their GeForce GTX 960 graphics card on 22nd January for a price point of $199 US which is the sweet spot for 1080P gamers and bulk of the sales from both companies amount from this market sector. 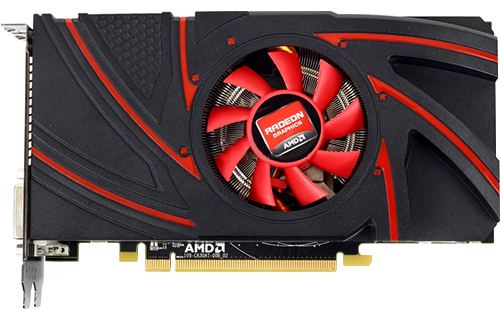 The graphics card Trinidad is replacing were also featured in the same price range with the Radeon R9 270 and Radeon R9 270X retailing at $179 US and $199 US respectively during their launch. It’s no doubt that AMD has left this space open for NVIDIA for more than a year. Even though they still have some good deals on existing cards such as the Radeon R9 280 which retails at $199 US however in the upcoming months, AMD plans to end production of their old Tahiti, Pitcairn and Cape Verde chip and move to newer chips. With NVIDIA pouring in more Maxwell chips in this market, AMD needs new chips at hand and Trinidad along with the upcoming series is the answer. We will wait for more information on the Trinidad since it does sound like an interesting chip to tackle NVIDIA’s GeForce GTX 960. On the other hand, AMD is also going to out their massive 300W HBM enabled chip, codenamed “King of the hills” based on a 28nm process in a last fight with NVIDIA’s own 28nm based GM200 chip which was revealed just a few days ago. These last 28nm chips of this longest running process generation will be competing in 2015.